Procurement is a generic term which describes various activities undertaken by a client who is looking to realise a construction project. It is the method, strategy, or path which is adopted to get a project built. Each procurement method follows a well established set of rules and procedures, and each method comes with its own degree of benefits, risk, and budget constraints. Every project is unique and presents different challenges; similarly every client’s objectives and expectations are different. At the early stages of the project we will help you choose the most appropriate form of procurement for your project. Often the choice of the procurement route is driven by considerations of ‘time’, ‘cost’, and ‘quality’ in relation to the design and construction of the building. Appointment of the successful Contractor is normally by competitive tendering. Full documentation are required for the tender process. Time is needed to prepare the information adequately. The Client has control over the design through their appointed consultants (i.e. architect, structural engineer etc). The overall process (from design to completion) is often longer due to the fact that design and construction are separate sequential processes. For the client there is a degree of certainty on construction costs since a contract sum is agreed at the tender stage, although this may need to be adjusted later if the works are varied. The client will normally need to appoint a professional consultant to act as Contract Administrator. The architect often carries out this role. Changes or variations to the design are possible as the works progress but this can result in additional costs and an extended construction duration. The Contractor is obligated to finish the works within a specified time, although the Contract Administrator can extend the completion date if there are delays for reasons listed in the contract. In summary this is a relatively low risk form of procurement which offers the client control over time, cost, and quality. The disadvantage is the length of time needed to realise the project since the design and construction stages are separate. The extent of the Contractor’s design responsibility can vary depending on how much design has been carried out by the client (or their consultants) and is included in the client’s requirements. Sufficient time must be allowed to prepare the client’s requirements which are normally compiled by the client’s consultant team (architect, structural engineer etc). Time is also required for the Contractor to prepare their design proposals and tender. The client’s requirements can range from a simple accommodation schedule, to a fully worked up scheme. The Contractor’s design proposals should match the client’s requirements. Design and construction can be carried out in parallel. This has the benefit of shortening the overall project duration. Although the project duration can vary depending on how much design responsibility is placed on the Contractor. 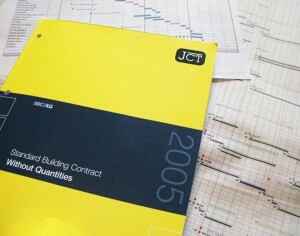 The contract sum is agreed pre-construction so there is reasonable cost certainty for the client. The Contractor is required to complete the works within the contract period. If the client makes changes to the works during the construction stage this may result in additional costs to the client, and additional time to complete the construction work. There is no requirement for an independent Contract Administrator. Instead the contract is initiated by the Contractor. The client may appoint an Agent to advise or act on his behalf. In summary – when considering cost and time – Design & Build is a relatively low risk form of procurement for the client. However with D&B there is often less control over the quality of the design and the execution of the design at the construction stage. The client appoints consultants to prepare project drawings, a project specification, and a cost plan. The client will need to appoint an independent contract administrator as part of the professional team. Design can proceed in parallel with construction so early starts on site are often possible and overall project time can be reduced as a result. There is no certainty over cost at the outset and work proceeds on the basis of the cost plan. The final cost of the project will not be known until the final works package is let, however costs can be monitored and controlled by the employer’s professional team. The client has control over design throughout the project through their professional team (architect, structural engineer etc).